China leads the world in investment in renewable energy, but they are also starting to pivot away from coal. “Earlier this year, the government ordered 13 provinces to suspend approvals of new coal-fired power plants. Another 15 provinces were ordered to delay new construction of projects that were already approved,” says Woynillowicz. Renewable energy has long gone from being “boutique to big.” In 2015, more than $325 billion was invested in renewable energy around the world. Some of the world’s largest utilities and “some of the largest and most recognized companies, like Google and Coca Cola and Walmart, are procuring huge amounts of renewable energy,” says Woynillowicz. Globally the jobs numbers are stunning. In the U.S. alone there are 220,000 solar jobs. 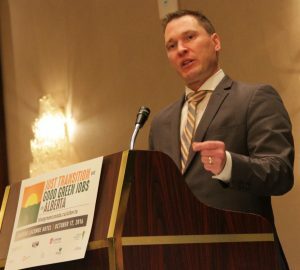 Alberta’s Minister of Economic Development and Trade said Alberta is looking for five gigawatts renewable electricity by 2030. He says that’s going to attract about $10.5 billion of new investment, and create 7,200 new jobs for Albertans. Photo David Dodge, GreenEnergyFutures. Back in Alberta Deron Bilous, the Minister of Economic Development and Trade, attached some numbers to Alberta’s transition goals. 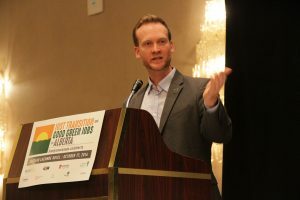 He told the Blue Green Just Transition conference that Alberta is looking for five gigawatts renewable electricity by 2030. He says that’s going to attract about $10.5 billion of new investment, and create 7,200 new jobs for Albertans. Even Saskatchewan, whose Premier, Brad Wall, is vehemently opposed to a carbon levy, has renewable energy ambitions. Within 15 years, Saskatchewan plans to get one half of its electricity from renewable sources. In terms of business and jobs the efforts of these two provinces are “Going to create all kinds of opportunities both for renewable energy developers (and manufacturers),” says Woynillowicz. Labour groups acknowledge climate change and know things have to change. However, they call for a “just transition” for affected workers. What does it mean to be “just”? 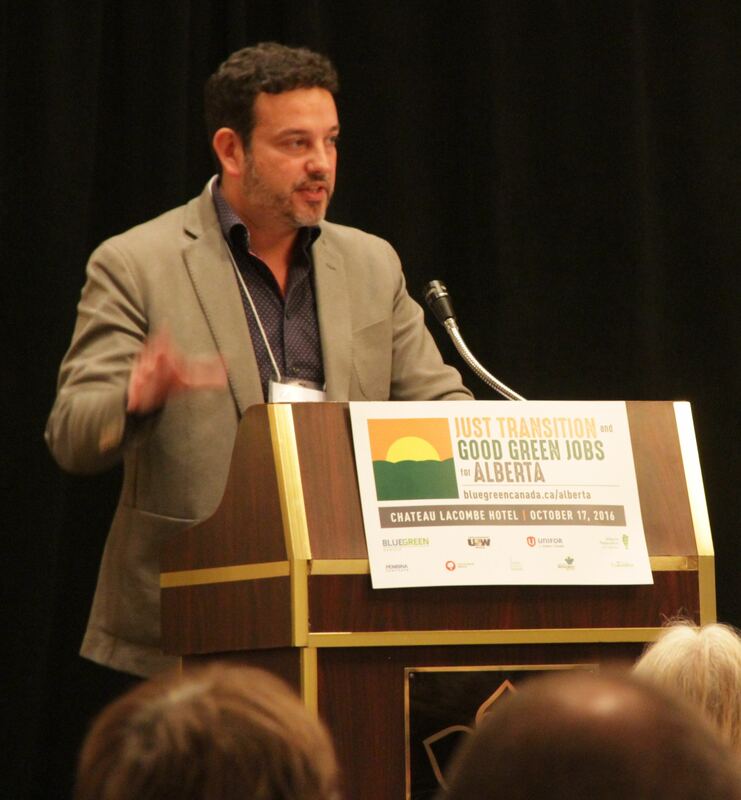 “Just Transition is the notion that workers who are affected by the transition from more polluting industries to a greener economy deserve special help in easing the transition,” said Gil McGowan, president of the Alberta Federation of Labour at the Blue Green Just Transition conference. Alberta’s government has pledged $3.4 billion to reduce the carbon levy’s impacts on low-income Albertans and the small business community. This will also help Alberta’s workers and businesses transition from coal. McGowan and labour unions formed the Coal Transition Coalition and took it on the road to the six communities in Alberta that will be most affected by the coal phase out. They also looked at other jurisdictions in the world to find examples of “just transitions” elsewhere. “What we heard, first and foremost, was a lot of anxiety,” and even “hostility” says McGowan. Not all workers were aware it was the Conservative government of Prime Minister Stephen Harper “that didn’t consult the public” and enshrined in law the phase out of 12 of Alberta’s 18 coal-fired electricity generation units. 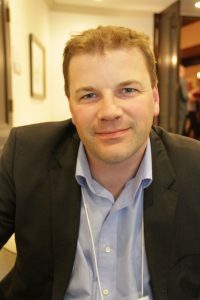 “What we said to the members when we met with them was that at the very least, we have a government that’s willing to consult,” said McGowan of Alberta’s new NDP government. McGowan said workers wanted programs to bridge benefits and keep pension plans solvent. They crave training for new jobs and many told McGowan they wanted electricity re-regulated in Alberta. Still, coal workers are anxious to say the least and they are looking for some certainty in a very uncertain future. Meanwhile the unions haven’t just been passively awaiting the future. Scott Crichton of IBEW says a union-supported solar training program has trained more than 1,200 electricians in one to five-day solar training courses since 2008. Crichton argues that while offering job training is important, consultation is critical. He says contractors should have a say so the most in-demand training is offered. He says they’re ready to customize programs to meet demands for workers in the marketplace. The Coal Transition Coalition has even proposed two of the newer coal plants could be updated to reduce emissions and grandfather them. Repurposing coal plants is not something we’ve heard much about in Alberta. The province desperately needs deep emission reductions. However, it’s not unheard of. In Ontario at least one coal plant was retrofitted to biomass. It seems Alberta is serious about tackling its nationally significant carbon emissions. Opportunity and diversification are in the wind, but workers want to ensure the transition is “just.” Time will tell.